Sarah Thompson is a wire artist known for her wire weaving designs. Being self-taught she is always exploring and finding new ways to work and layer the wire to create complicated designs that are reminiscent of the look of metalsmithing without the solder. Everything is sewn together using fine-gauged wire. This process creates a beautiful, sculptural, flowing style. She has been working with wire exclusively since 2009, started teaching in 2010, and began her journey as a national instructor in 2015. Her Thistle design won the Best in Show in the 2014 Bead Dreams contest. The following year, her first book came out “Fine Art Wire Weaving”. She has a Craftsy video “Wire Woven Bracelets: Basics and Beyond”, has written several articles for Step by Step Wire magazine, and is currently working on a second book. She lives in Spokane, Washington with her 5 kids and a wonderful, supportive husband. Learn how to guide and shape the wire by hand to create an organic flowing design. The focus will be NO TOOLS. I want to challenge you to learn how to use your hands more and rely on your tools less. I will show how you can use your hands to even fix your mistakes. Because of the organic nature of the design everyone's pendant will come out unique and one of a kind. There will be many opportunities to add your own personal touches including adding beads and gems for splashes of color. No requirement needed to take this class though I do recommend that you are familiar with wire weaving, I will teach the two weaves we will be using but we won't have very much time in class to practice before jumping into our pendant. 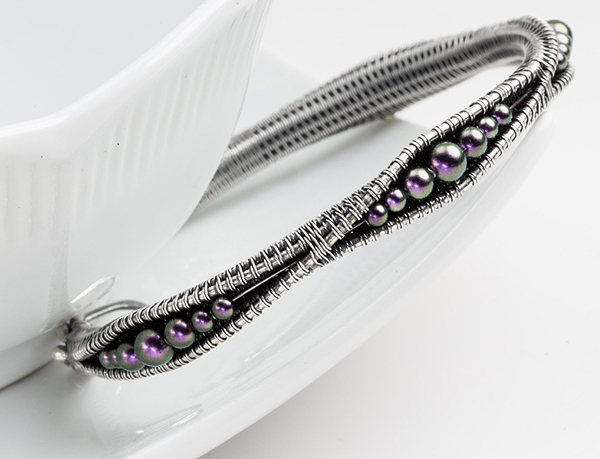 Learn how wire weaving can be used to create a sculptural dynamic bracelet. The focus will be learning to see the weave 3-dimensionally and how to create a compact weave in the process as well. No requirement needed to take this class. Students will have time to practice weaving sculpturally before jumping into their bracelet. This bracelet can be made without beads in the center, with pearls, Swarovski pearls in graduated sizes, or with small micro beads. Kit price - $55, does not include the pearls or beads you may want to add to your bracelet. This class is all about the details. We will focus on how to perfect symmetry as I give all my tips that I use. Once we start mastering our symmetry skills we will turn to filing and polishing techniques to further enhance your wire work. You will be amazed at the level of workmanship you will achieve in class. Students need to come to class familiar with wire weaving. Print out and mail the registration form as per instructions.